Meritage, pronounced like heritage, is a blend of the words merit and age and is a designation used to reflect excellent wines blended in a Bordeaux tradition and came to use in the USA in the 1980’s to reflect New World wines being produced using traditional Bordeaux varietals. Our own Harry McWatters was instrumental in bringing this term to use in Canada, and we continue to offer both white and red Meritage wines in our TIME and McWatters wines. Red Meritage wines historically have been among the world's most highly rated wines. They are prized for their smooth, silky texture and complex, robust structure. While they age beautifully - often for decades - most are also very drinkable in their younger years. 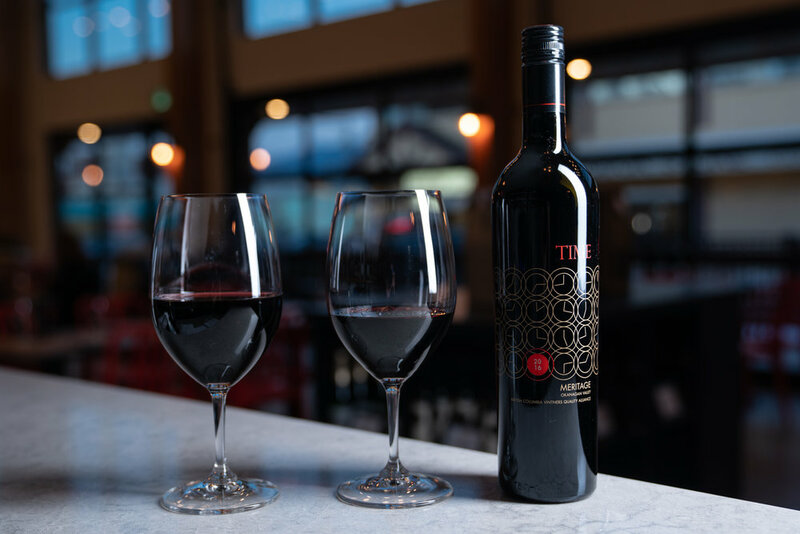 A Red Meritage is a blend of two or more of the red "noble" Bordeaux varieties - Cabernet Sauvignon, Cabernet Franc, Malbec, Merlot, Petit Verdot and the rarer St. Macaire, Gros Verdot and Carmenère. If the blend includes any other grape variety, it is, by definition, not a Meritage. Also, to qualify as a Meritage, no single grape variety can make up more than 90% of the blend. White Meritage wines, while rare, are some of the most elegant and exquisite white wines crafted. The perfect accompaniment to seafood and poultry, White Meritage is a very food-friendly wine, but also is superb just on its own. Unlike many white wines, White Meritage is perfect for cellaring - growing more complex with age. To qualify as a White Meritage, a wine must be a blend of at least two of three specific white "noble" varieties - Sauvignon Blanc, Semillon or Muscadelle du Bordelais. No single variety can make up more than 90% of the blend. The wine does not qualify as a Meritage if the blend includes any other grape variety.